Spotted, waiting on the metro platform: young woman, maybe 20 years old, but I doubt it, reading First Love, by Ivan Turgenev (in French). I wanted to pat her on the arm, take the book away from her. You're too young, dear. Wait 20 years, then you might understand it. Nikolski is a remarkable little book. It's a quick, easy read. It's funny. I can only hope that it was grasping at straws, during the Canada Reads debates, when it was argued that Nikolski was disjointed and hard to follow, that it was unconventional, that it was too much work. That's ridiculous! It hardly stretches the bounds of traditional narrative structure; it certainly doesn't qualify as experimental. What you have is two strong threads and one much thinner one intertwined, but they're pulled out straight from start to finish — the story is completely chronological, and it's always clear which thread is being followed in any given chapter. Cartography is a running theme, not least how we map family. Joyce spontaneously proclaims cartography as her intended profession to her high school counselor, but I don't think she means it seriously. Within a few years, however, she is mapping Montreal for the type and quality of its trash, associating it with businesses, financial records, receipts. Then she maps computer circuits. The work is not as simple as it may appear; the S. W. Gam Bookshop is one of those places in the universe where humans long ago relinquished any control over matter. Every shelf holds three layers of books, and the floorboards would vanish altogether under the dozens of cardboard boxes, but for the narrow, serpentine paths designed to let customers move about. The slightest cranny is put to use: under the percolator, between the furniture and the walls, inside the toilet tank, under the staircase, even the dusty closeness of the attic. Our classification system is strewn with microclimates, invisible boundaries, strata, refuse dumps, messy hellholes, broad plains with no visible landmarks — a complex cartography that depends essentially on visual memory, a faculty without which one won't last very long in this trade. The deliveryman's job, which he initially viewed as dreary, suddenly seems to him like an ideal way to map out the neighbourhood. Riding his bike, he constructs an aerial view of the territory — squares, alleyways, wall, graffiti, schoolyards, stairways, variety stores and snack bars — and when he talks with the customers, he gathers intelligence on accents, clothing, physical traits, kitchen smells and bits of music. Added together, the two catalogues make up a complex map of the area, at once physical and cultural. All three characters are breaking with their past, stepping out of the lives they were raised in, even while desperately hanging on to them (mementoes, newsclippings, letters "home" that never reach their destination), and in so doing they are, ironically, fulfilling their nomadic, pirateering, scavenging destinies. It's all written with a light touch, and there's a marvellous sense of the interconnectedness of our lives, what a small world it is, even while we are insular and don't talk to our neighbours. There are also some wonderful thoughts on the archeology of garbage. "It's still available," Maelo affirms. "You know I give priority to political refugees?" Stammering, Noah says, "I come from Alberta." "Okay," Maelo answers, apparently satisfied. Hello, Internet! How've you been? I've been distracted. There's just not enough time in the world. I've been busy, kinda. And sick, some. Mostly I'm just tired. I had this other little project on for a while — Bookdrum. Have you heard about Bookdrum? It's a depository of multimedia annotations on hundreds of novels. Bookdrum's set up to integrate images, music, maps, video, etc, so it can provide a richer experience than straight-up text summaries. I was invited to participate, and it seemed like a good idea and one novel immediately came to mind, so I jumped on the opportunity to mark it up. Has anyone contributed to this project? I don't get why it's a drum. Perhaps definition 5d of Merriam-Webster comes closest: "a disk-shaped magazine for an automatic weapon." Nothing else much seems to fit as well as this, although its hard to attribute a shape to web-space. Anyway, I worked on annotating (for lack of a better way to describe it) The Razor's Edge, by W Somerset Maugham, a book that I feel peculiarly bonded to. And a marvelous experience it was. I realize how much I accept as given, when I read, being too lazy to understand it. For example, vocabulary. One component of the book profile is a glossary. This made me consider, as I read, whether I fully knew what was being stated. So much of my comprehension depends on context, and it's quite humbling to identify all that you don't know with certainty. But now I can tell you all about the dresses Isabel wore, and where Elliott got his shirts, and how Larry's interest in the mystics is foreshadowed in his reading William James's Principles of Psychology, and what paintings Louisa had on her walls. And the scenes are richer for it, and the characters loaded with meaning. Maugham is a bloody genius, and so underrated. Though I suppose I might say this of any author I put to a similar degree of scrutiny. Well, right; I knew of this project before Christmas, but then there was Christmas, what with the shopping and drinking and travelling, and then catching up on work, and then I had to go to Cuba. Fortunately, the Bookdrum people extended their deadline, because then I was sick for a whole weekend, and I had something else to do. But then I worked really, really hard on it for about a week and a half. And I was pretty proud of it. Only I'm still not done! And I haven't bothered to do much about it this last month. Where does the time go? Another crunch at work. And this vicious cold that won't go away (how can so much mucus even fit inside my head?). J-F was away for over a week, so that meant not being able to say would you mind picking up the kid tonight cuz I'm running a bit late at work, or do you think you could walk the kid to school this morning cuz I really need to just sit here and drink my coffee for a few more minutes. And for some reason, I don't quite understand why, it meant undertaking projects that involved a deeper level of involvement, like finally opening that kit she got for her birthday and making sand drawings, or shopping for vegetables and prepping them and chop, chop, chopping them to make potato salad like mom's, which may not sound like a big deal, but with a 7-year-old it's a day long feat to boil the carrots, and chop the radishes and the pickles and the this and the that and finally to have a meal of it. Plus the need to revisit some Doctor Who episodes. All of which meant quiet was a scarce commodity, so when it came, I wrapped it up and took it to bed with me. Ah, to curl up in bed with a book instead of the laptop. And in this way I devoured that Fred Vargas book and then The Girl Who Played with Fire. And then I found much-needed stillness in The Winter Vault, about which I have a whole lot to say yet. Did you follow Canada Reads? Some years are better than others, and this was a good year. I actually hadn't read any of this years's contenders, but was rooting for Nikolski based on what little knew of it, and Yay! it won! Thanks to the fine folks at CBC, and for whatever contest it was that I entered, I know have a full set of this year's featured books. I've already started Nikolski, and lo and behold! it's the name of a place, not a person! The other evening Helena told me she thought we ought to be listening to music. Rock and roll, she suggested. So I put on The Clash, and we danced. Then The Clash brought out their horn section, and Helena brought out her air trombone, and I thought, rock 'n' roll, baby! Something made her cry tonight. I don't remember what it was — nothing serious, which is why I chided her gently for crying at all, and she said the most interesting thing. "But it's not me that's crying; the crying happens all be itself." I should go to bed. I haven't been sleeping well. Last night I dreamed I was taking care of my sister's cat at her place across town, although in reality she has no cat and lives miles further away than across town. I kinda stayed at her place for a few days, and forgot all about my own cat at my own home, and when I remembered, I felt awfully guilty, and then I carried Rosie around with me everywhere, even to work, only she kept shrinking. Someone offered me a ride home, and we made a couple stops, but then I freaked out because it was 6:30 and I'd totally forgotten I was supposed to pick the kid up at school. Are everyone's dreams like this? I mean, banal yet stressful. I don't generally remember my dreams, so when I do, I spend way to much time thinking about the phenomenon. OK, that's it, I'm really going to bed now. Maybe I'll manage to read a couple pages before my eyes fall shut. G'night, Internet. I'll write more soon. He's still a fine bookbinder, but he's old now, and can't do all the work on his own. I like sitting with him at the big table, with vise clamps and glue and the smell of leather. Sometimes we don't talk the whole day. I can't tell you how much I like him, I like the way he touches the leather, I like that he's neat, every petit fers and mullen and marbling comb in its place, every pot of aqua regia and myrabolan tannin wiped clean after use, every endpaper cross-catalogued by colour and texture and age, and then filed away in square drawers — in a cabinet he built himself. I like that he keeps his letters from Edgar Mansfield close at hand in a wooden box on his worktable. He collects moss and mushrooms and photographs them. People come to his door with specimens, squares of moss in little boxes, like jewellery, or envelopes of fungi from all over the world — from Bolivia, India, New Zealand, Peru. He puts samples under a microscope and draws what he sees. Sometimes he uses the shapes in his designs, carving them into the leather of the books, a beautiful effect, almost marbled. When we sit together I feel even his silence is orderly, as if he says to himself, Okay, today we will not talk about what happened in 1954, today we will not talk about what happened when my wife went to the doctor, today we will not discuss the pain in my knee or the grief that bulges out suddenly sometimes from being childless, today we will not discuss Jakob Böhme, or spores, or what the rain reminds me of. It is a good feeling, to sit at a table with a man and not talk about specific things together. He thinks and I think, we keep each other company, and at the end of the day it is as if we'd had hours of intimate conversation. — from The Winter Vault, by Anne Michaels. It was generally expected that Commandant Adrien Danglard would resolve the puzzle, partly because he was Adamsberg's longest-standing colleague, having spent years alongside him in a relationship which allowed for no concealment or precautions, and partly because Danglard couldn't stand Unsolved Questions. These Unsolved Questions cropped up at every turn, like dandelions, turning into a host of uncertainties, fuelling his anxiety and making his life a misery. Danglard worked ceaselessly to eliminate the Unsolved Questions, like a maniac who keeps trying to remove non-existent specks from his coat. The gigantic task usually led him to a dead end and then to a feeling of powerlessness; the powerlessness, in turn, drove him down to the basement of the building, where the bottle of white wine was concealed, the only thing that could help him deal with any Unsolved Question that was too thorny. If Danglard took the trouble to conceal his bottle so far away, it was not for fear that Adamsberg would discover it, since the commissaire was, by some supernatural means, perfectly aware of his secret. It was simply that going up and down the spiral staircase to the basement was sufficient of an obstacle for Danglard to postpone calling on his heart-starter until later. So he patiently gnawed away at his doubts at the same time as he shewed incessantly at the ends of his pencils. Adamsberg had developed a theory running exactly contrary to the pencil-chewing, which posited that the number of uncertainties a single person can support at the same time cannot multiply indefinitely, and reaches a maximum of three or four. That did not mean that there were no more, but that only three or four uncertainties could be in proper working order simultaneously inside a human brain. Danglard's mania for eradicating them was therefore futile, since no sooner would he have resolved two Unsolved Questions than another two would take their place, and he would not have had to concern himself with these if he had had the wisdom to stick with the old ones. Danglard had no time for this hypothesis. He suspected Adamsberg of liking uncertainty to the point of inactivity. Of liking it to the point of deliberately creating it himself, to cloud the clearest perspectives, for the sheer pleasure of wandering irresponsibly through them, in the same way he liked walking in the rain. If one didn't know the answer, if one didn't know anything, why bother one's head about it at all? The sharp conflicts between Danglard's precise "Why?" and the commissaire's nonchalant "I don't know" punctuated the squad's investigations. None of the others tried to understand the core of this bitter struggle between accuracy and vagueness, but they all favoured one side or another. The positivists thought that Adamsberg dragged out investigations, taking them wilfully into the fog, leaving his colleagues trailing behind him without instructions or road maps. The others, the cloud shovellers — thus named after a traumatic visit by the squad to Quebec — thought that the commissaire's results quite justified the vagaries of the investigation, even if the essentials of his work methods escaped them. According to mood, or to the circumstances of the moment, which might inspire either jumpiness or relaxation, someone could be positivist one day and cloud shoveller the next or vice versa. Only Adamsberg and Danglard, the two principal antagonists, never varied their position. — from This Night's Foul Work, by Fred Vargas. Have I mentioned how much I enjoy Fred Vargas? This is the fourth book of hers I've enjoyed since last summer, and I think they're near perfect: delightfully odd and complicated and subtle characters, philosophical outlook and sly humour, and general I-can't-quite-put-my-finger-on-it charm. The stories are quite good too. I had high hopes for The Forty Rules of Love: A Novel of Rumi, by Elif Shafak, but it comes up short. This is a story within a story. Modern-day Ella is unhappy in her marriage and she strikes up a correspondence with the author of a manuscript she's reading for work. It's his novel, about the relationship between a wandering dervish, Shams of Tabriz, and the Islamic mystic poet Rumi, that is the heart of the book. The forty rules are nuggets of wisdom, distilled by Shams from the Qur'an. 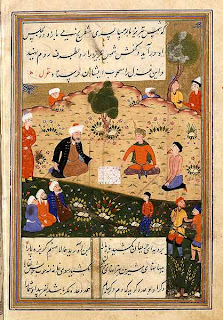 The rules themselves do not exist historically — they are original to Shafak, inspired by Sufism. This is a lovely window onto Islam as a religion of love. It's fairly simply told, but this veers toward simplistic, which is a shame; the material is so rich to be treated superficially. I guess Ella's story is our way in to this "exotic" tale. But it takes up only a few pages, interspersed throughout the turmoils that Shams and Rumi suffer. There's no nuance to her. While I can relate to what she represents on some levels, her character does not live and breathe. The novel would be stronger without her. The American housewife simply doesn't ring true from the pen of the Turkish writer, and it feels like an artificial device for attracting a certain type of reader. I didn't really like this book — mostly I think it's just not very well written. However, Shafak's rules offer plenty of food for thought. I've found myself talking about this book quite a bit, even though I wouldn't recommend it to anyone (there are richer texts in the world!). I continue to ask myself: Is it true hypocrisy makes people happy, and truth makes them sad? What does it mean to not go with the flow, but to be the flow? Laughable, maybe; but it is a way in. Live this life as light and empty as the number zero. We are no different from a pot. It is not the decorations outside but the emptiness inside that holds us straight. Just like that it is not what we aspire to achieve but the consciousness of nothingness that keeps us going. My first McEwan (Saturday) was an intellectual seduction. My second McEwan (Enduring Love)... it was love. My third McEwan (On Chesil Beach), I was basking in the afterglow. My fourth McEwan (Atonement) — I was confused and bit angry about it. This, Solar, is my fifth book by Ian McEwan. I spent the first half of the novel deciding it was over, the love is gone. The second half had me reconsidering, that there might be something more substantial here, worth puzzling over and working through. The genesis of the book was McEwan's journey to the Arctic circle in 2005 with a mixed group of scientists and artists to witness climate change at first hand. "I adored that trip," he says. "While the sculptors and painters did their thing, I just hiked around with whoever would come with me." Walking the frozen fjords with Antony Gormley he discussed landscape and imagination. At dinner there was "idealistic conversation about how we had to be different in our relations with government". But just the other side of the door from the living quarters was a boot room. "It was chaos. There was no malice, but people were careless and would inadvertently borrow each other's stuff. Clothes and equipment there to save our lives, which we should have been able to look after very easily, would go missing, and I thought, for all the fine words and good intentions, maybe there was a comic inadequacy in human nature in dealing with this problem." Copenhagen confirmed his fears. "It was unprecedented for world leaders to be summoned by science. But it resulted in disarray and conflict with elements of Whitehall farce. So I thought that if I ever did get round to this project, I would want to write about a very flawed guy. Someone hopeless, or hopelessly self-interested." Thus, Michael Beard, Nobel Prize-winning physicist, was born. He's not likable at all, and I don't think McEwan works very hard to make him in any way sympathetic. I couldn't bring myself to care what happened to him. Certainly Beard doesn't care much about anyone or anything — for all his abstract work in photovoltaics, I don't feel he ever really believes that climate change is a real problem. The point of him seems for us to be able to point and laugh at him, and puzzle over how a Nobel laureate can be so subaverage, so stupid, on so many levels. There are three broad hypotheses about the sources of the very substantial disparities that this conference's papers document and have been documented before with respect to the presence of women in high-end scientific professions. One is what I would call the — I'll explain each of these in a few moments and comment on how important I think they are — the first is what I call the high-powered job hypothesis. The second is what I would call different availability of aptitude at the high end, and the third is what I would call different socialization and patterns of discrimination in a search. And in my own view, their importance probably ranks in exactly the order that I just described. Certainly it was a hot topic in that neighbourhood of the blogiverse that I frequented then. McEwan in his acknowledgements credits the exchange between Steven Pinker and Elizabeth Spelke, which was directly spawned by Summer's comments. (Hey, Ian, It's Edge.org, not Edge.com — this is why it's a good idea to have someone check your work.) This to say the character of Beard does have solid grounding in reality, even if it is unpopular and unpleasant. The flight from Berlin was a typical failure. At the start, as he lowered his broad rear into his seat, barely two hours after a meaty Germanic breakfast, he was forming his resolutions: no drinks but water, no snacks, a green-leaf salad, a portion of fish, no pudding, and at the same time, at the approach of a silver tray and the murmured invitation of a female voice, his hand was closing round the stem of his runway champagne. A half-hour later he was ripping open the sachet of a salt-studded, beef-glazed, toasted corn-type sticklet snack that came with his jumbo gin and tonic. Then there was spread before him a white tablecloth, the sight of which fired some neuronal starter gun for his stomach juices. The gin melted his remaining resolve. He chose the starter he had decided against: quails' legs wrapped in bacon on a bed of creamed garlic. Then, cubes of pork belly mounted on a hill-fort of buttered rice. The 'pavé' was another of those starter guns: a paving slab of chocolate sponge encased in chocolate under a chocolate sauce; goat's cheese, cow's cheese in a nest of white grapes, three rolls, a chocolate mint, three glasses of Burgundy, and finally, as though it would absolve him of all else, he forced himself back through the menu to confront the oil-sodden salad that came with the quail. When his tray was removed, only the grapes remained. I do wish I'd known before starting in that Solar is a comedy (though a tragic one, to be sure). (That'll teach me for not reading the jacket flaps!) Had I been so predisposed, I might've found it much funnier. As it was, expecting something serious, and even though I chuckled aloud at least twice, I never really found my groove with respect to the tone of the book. Maybe I just don't find McEwan funny. Or maybe it's a British thing. Despite my not loving it, I think Solar would make an excellent bookclub read. Beard's personal and marital failings, along with his social faux pas, not to mention the issue of climate change (and the role scientists, politicians, and artists ought to play), are great fodder for discussion. Oh, right, and the crime — there's a pretty big crime committed, which, even though it's pretty central, kind of gets glossed over. The ethics of that whole thing is also something to talk about. But see? There's all this interesting stuff — it just doesn't hang together well. that may deepen your appreciation of him. 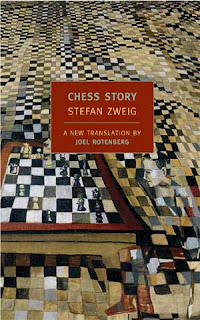 Chess Story (previously published as The Royal Game), by Stefan Zweig, is a great novella, with all the elegance I'm told the game itself possesses. Chess fascinates me, but on some level, I feel I don't really know how to play. That is, I know all the moves, but I can't make the pieces dance the way I think they ought to. I played the very occasional game when I was growing up, with a cousin at the cottage, on game day at school. I sought out a few more games as an adult; my boyfriend du jour (well, three I can think of off the top of my head) would say he played, so we would, every other night for a week or two, and I was pathetic really, but eventually I'd beat him, and we'd never play again, and then we'd break up. I'd say these most satisfactory wins had more to with pig-headedness, somehow magically staring the board into submission, than with any kind of mastery of skill or insight. These days the kid is in chess club, so I'm learning terms and notation, and rules I never knew existed. I guess I'm also trying harder to see the art and philosophy of it, to know its mindset, to help her find a way in. I know that the possibilities on the board at any given time are finite. Certainly I cannot calculate them all, nor is there a need to — so many of them amount to being meaningless or inconsequential (it's not quite the same thing, is it?) that the relevant possibilities are significantly reduced. Still, I can only "think ahead" so far, and I'm in awe of the "instinct" some people seem to have for it. Anyway. The book. The story is essentially a meeting of two players, two different types of player who come to the game via very unique histories. It's also very clear that psychology is a major element of the game — the very particular game that's the main event here, but also of their individual game styles. One player is world chess champion. Of humble upbringing, he came to the game quite by accident as a teenager, and rather astounded everyone with his skill, because he was otherwise generally thought to be something of an idiot. He is criticized by some for his limitation of not being able to play "blind" — he has to have a board physically in front of him — and this betrays a lack of imaginative power. But it's a power game, isn't it? He bullies his way through, controlling the conditions, intimidating his opponent. The other player also came upon chess quite accidentally. In confined circumstances a chess manual comes into his possession, and he spends his days, for months on end, poring over it. He has never played on a board, only in his mind. I don't doubt, given the reference to the politics of Nazism, that there is some allegory here also, for the struggle between classes, or whatever else these two characters might represent, but that interests me less. Right, so: 84 pages, absolutely gripping. I first heard about this book from Richard: Thanks! I may search out some more Stefan Zweig. I admit I got a bit tired of hearing about The Post-Office Girl, and I still can't get excited about it, but I hear Beware of Pity is devastatingly good. Also, the recent screed against Zweig in the London Review of Books makes me want to read him more. If this sort of book interests you, might I also suggest The Master of Go, by Yasunari Kawabata, which relates a real-life match of Go ("If chess is a battle, Go is a war. "), pitting the upstart modern world against the traditional old guard. At this point, my rambling here is almost as long as Chess Story itself. (Oh, I hope I haven't said too much and spoiled it for anyone.) Go read it.